We provide high quality flooring products to update and upgrade concrete floors. Epoxy coatings continue to evolve and now have an unlimited color range and include a metallic epoxy, our REFLECTOR™ Enhancer which provides depth of color and design never seen before. 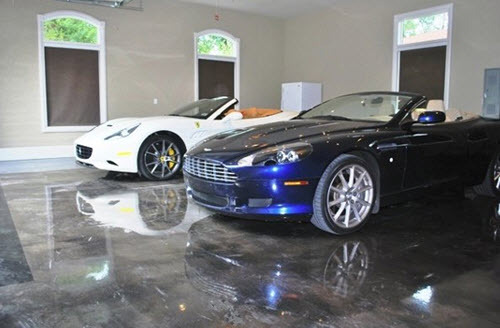 Our floor coating systems work on a variety of concrete surfaces. They can be used to repair damaged concrete floors or placed on freshly laid concrete. Epoxy has become a generic term for a variety of resin floor coatings. Typically several components are mixed together and the fully cured product is the beautiful and durable flooring you see in home design. 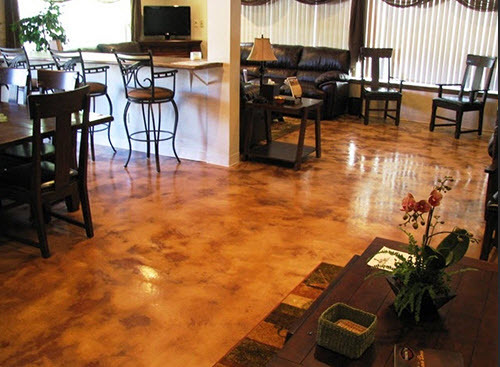 A popular interior finish is the Epoxy Color Flake Flooring which is durable and cost effective. The color flakes come in any color combination you choose and can be blended to make custom colors and effects. With the development of metallic epoxies, the REFLECTOR™ Enhancer Flooring System enables us to use metallic powder to create depth of color and design effects never before seen in epoxy flooring. We're able to combine the strength and durability of epoxy with custom paint and natural chemical reactions that provide a unique flooring design. These flooring styles can be elegant or industrial depending on the colors and mixes chosen. ​Polished concrete is fairly popular but people are finding that it's not as durable as promoted. And it's not stain proof. Our REFLECTOR™ Enhancer products give the look of metallic ground polished concrete but with the toughness, durability and easy-clean features of resin coatings. With our coatings, you'll have the abrasion resistant protection and high gloss shine with the creative design elements you choose. Our REFLECTOR Enhancer or HERMETIC™ Flooring Systems give the look of ground polished concrete that people want in an easy to care for application. These flooring systems can achieve even higher levels of abrasion and chemical resistance with an additional coat of urethane if your projects requires it. This level of durability is becoming the standard for industrial and commercial floors. Contact us today to discuss all of our options and which combination is best for your project. Our residential products can be added with other resins to create commercial grade flooring that's suitable for malls, arenas and other highly trafficked areas. Capture the color and shine of our Enhancer Flooring created especially for retail spaces. 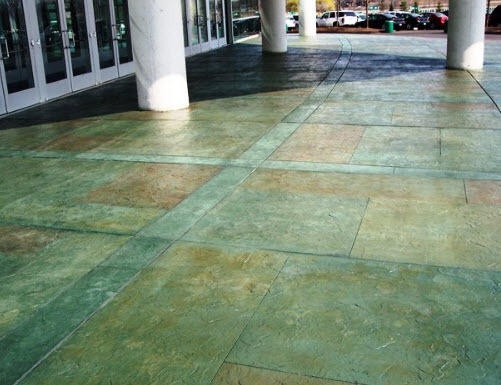 Our cementitious overlays which are pre-packaged products with polymer modifiers can be placed directly over damaged concrete and then stamped with a template to achieve the look to match your design. These products can be used for concrete patching, restoration, regrading and leveling surfaces. HERMETIC™ Paramount Heavy Duty Floors are fluid applied floor coatings when a durable, high performance flooring is required. A heavy duty, floor repair resurfacer is trowel applied to smooth surfaces and establish a level floor. The resins used in the mixture create a durable finish that is easy to maintain. And provide significant resistance to abrasion, petro-chemicals and other contaminants. 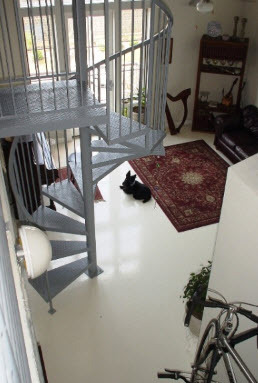 ​Why Use South-East Paint Co. for your Epoxy Flooring? Expertly trained team of paint contractors certified as Elite Crete Systems installers for proprietary resins and coatings. 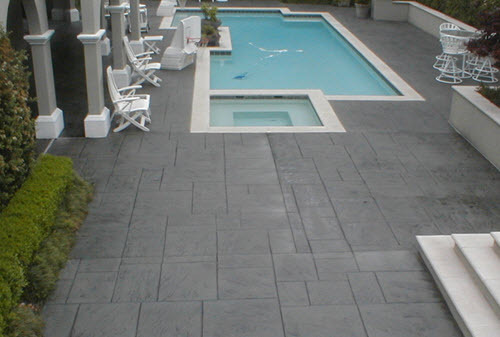 We use only the Elite Crete trademarked products which provide the durability and quality finish. 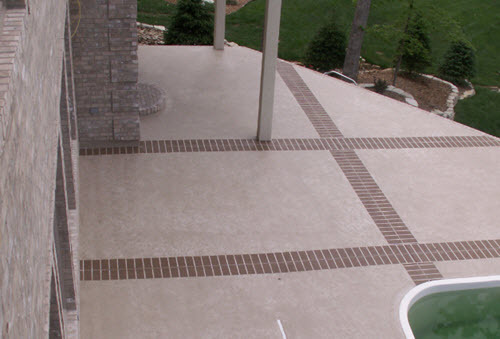 Elite Crete Systems is a leading manufacturer of specialty concrete coatings and flooring products. 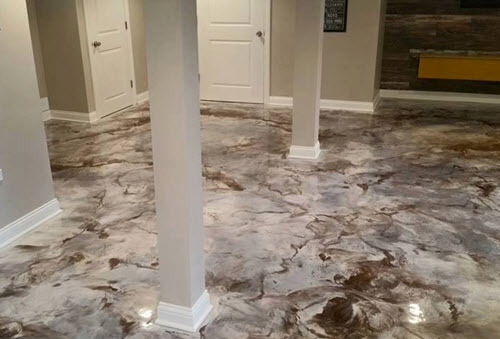 They have been winning awards in flooring design for over a decade and provide the most innovative and durable decorative concrete flooring systems available. Slate Trowel Down flooring applied to concrete surface that previously had tiled floors. Total thickness, less than 1/8 inch but these floors are tough, durable and flood proof. 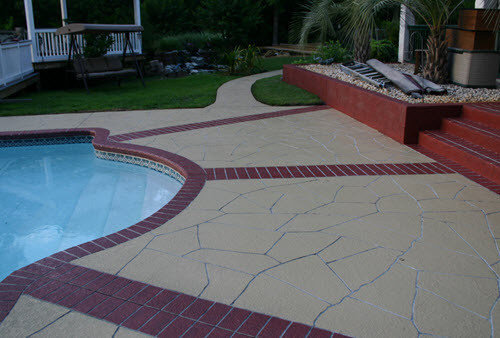 THIN-FINISH™ Pre-Mixed Overlay, colored with CHEM-STONE™ Reactive Stain and sealed and protected with clear epoxy and clear urethane top coat. ​A Whole New Level of Resinous Flooring! ​For a new look for your home! Thin Stamped Overlay Ultra Stone with Antiquing Stain sealed with emulsion.